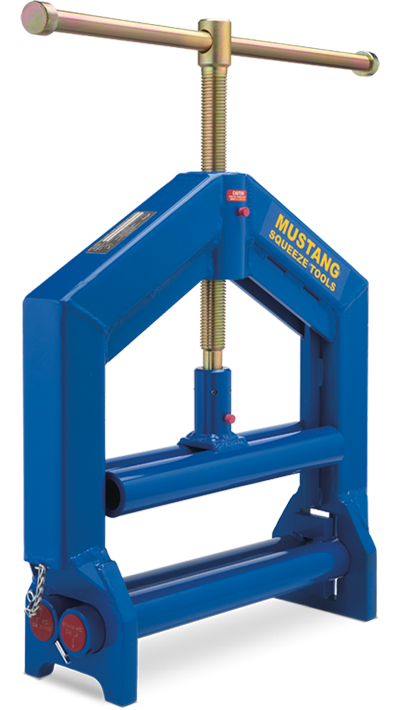 The DBGA-80 Double-Bar Squeeze Tool is the largest manual tool in Mustang’s lineup and is an economical means of squeezing-off large diameter PE pipe. The dual-bar lower jaw has two sets of gap stops for the two pipe sizes of your choice. The same rugged design as used in all Mustang toolsis utilized to provide maximum strength, lighter weight,and superior performance. Nearly identical to its “little brother” the DBGA-60, the DBG-80 features the same proven tubular frame, powerful Acme Power Screw and Upper Jaw Thrust Bearing with grease fittings for lubricating the screw and thrust bearing. Includes a pair of SC-80 Saddle Clamps.